It all began around this time in 2013, when The Legal Genealogist got an email with a return address of americanbar.org — and almost deleted it. I figured it was a pitch for membership in the American Bar Association. And, since it’s been a loooooong time since I was in active law practice and I don’t keep an active law license, I had my finger on the delete key when — for some unknown reason — I decided to read it before deleting it. That recognition, from the prestigious American Bar Association Journal, was cool. Then around this time in 2014, I got another email, and it had a return address of americanbar.org, too. Then just about this time last year, in came another email, and it had that same americanbar.org return address. So… yesterday afternoon, my email program started whining for my attention and there it was, with a return address of americanbar.org. And that — no doubt about it — is definitely cool. And since any recognition I get is really a reflection of the support of the readers of this blog, all I can say is… thank you. I’m honored and grateful. And we can all be thankful in this Thanksgiving season for one thing more about this Blawg 100 thing. 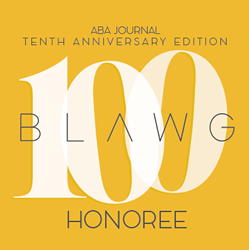 In the past, the ABA Journal has also had vanity voting, where readers of blogs in several categories got to vote for their favorites. Considering that we’re still recovering from some other election, I suspect we can all be grateful for that, too. Perhaps this will count as an early vote for next year. Feel free to stuff it in as many boxes as you like! Congratulations! Well deserved Judy! Also, love the first few footnotes about your ‘blawg’award. Congratulations! That’s a great honor. I really enjoy reading your Blog and appreciate all the wonderful work you’ve done. It’s one of my email subscriptions I never get tired of reading. Yeah!! You’re always a winner to my non-lawyerly eyes. Congratulations indeed. Judy, you have been recognized for the great job you do, but I feel all us readers have been the big winners learning from you!